Every now and then I like a good falafel wrap for lunch. When I get this craving, I will usually go out to one my favorite food carts and grab one for a fast, healthy meal. 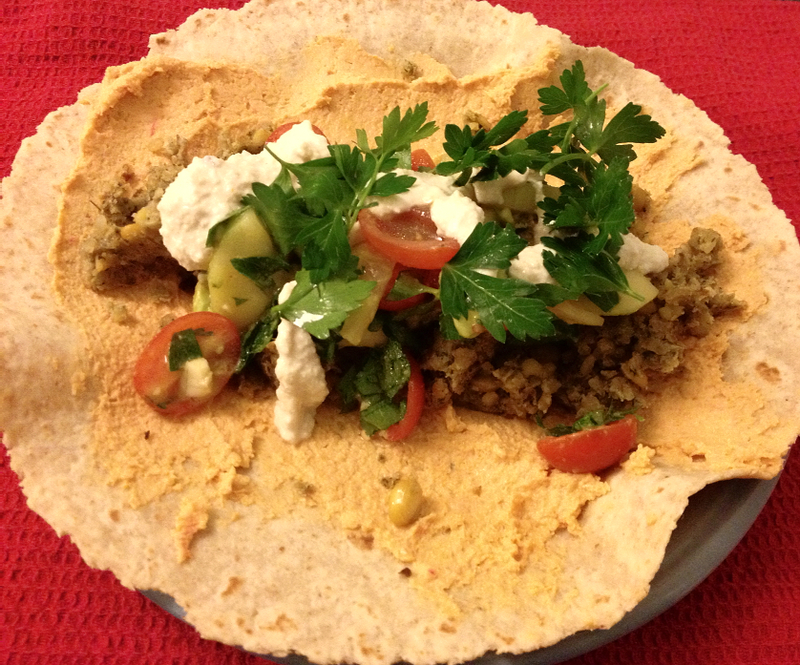 Last weekend I was tooling around in my kitchen, and realized that I could easily make an authentic, vegan, falafel wrap with Falafel Sunshine Burgers! This recipe combines crisp and fresh cucumber tomato salad, hearty Falafel Sunshine Burgers, and creamy cashew lemon-Tahini sauce, for a well-balanced crowd-pleasing meal. One thing I like about this recipe is that you can make the cashew-tahini sauce the night before. The rest of the meal can come together very quickly and with relatively little mess, for a healthy and fast-weeknight meal. With this blog post brings another opportunity for one lucky reader to win a coupon for a free box of Sunshine Burgers. All you have to do is leave a comment on this post about what you like about this recipe. Best comment wins! The winner will be selected on Wednesday at 10pm ET. Contest is open to residents of the United States. Good Luck! To start the cashew lemon-tahini sauce, put all of the ingredients in a blender cup and pulse until smooth. Once finished, the consistency will be smooth with just a slight amount of cashew texture. If you are having trouble blending to the proper consistency, turn the blender off, scrape the sides of the blender cup, and add additional water 1 tablespoon at a time, and pulse again. For the salad, place all of the salad ingredients in a medium sized mixing bowl and toss until well combined. Adjust seasoning as necessary. To assemble the wrap: spread 2 tablespoons of hummus on a whole wheat tortilla. Crumble 1 Sunshine Burger on top of the hummus. With a slotted spoon, scoop about 1/3 of the salad mixture on top of the tortilla, then top with a drizzle of the cashew lemon-tahini sauce. Wrap the tortilla over the ingredients and enjoy! This entry was posted in Dinner Recipes, Sunshine Burger recipes, Vegan Recipes and tagged cashew sauce, creamy vegan sauce, cucumber, easy vegan meals, Falafel, Falafel Sunshine Burger, garlic, harissa, King Harvest Hummus, lemon, olive oil, parsley, roasted peppers, Sunshine Burger, tahini, tomato, whole wheat. Bookmark the permalink.